The site of the first European settlement in New Hampshire, founded in 1623. During World War II, it was home to Fort Dearborn, a U.S. Army base. Visitors will enjoy canoeing, walking trails, a bike path and picnic areas. In the winter, cross-country ski trails are available. The park is also home to the Seacoast Science Center , which holds events throughout the year. 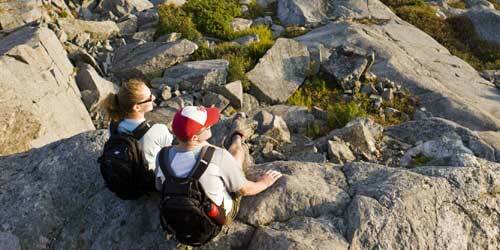 Monadnock State Park is thousands of acres of protected lands around 3,165-foot-tall Mount Monadnock. The park and mountain are famous for their extensive hiking opportunities. There are over 40 miles of trails and a spectacular view of New Hampshire, Vermont and Massachusetts at the mountain's summit. 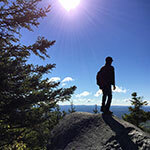 Monadnock State Park is open year-round unless closed or restricted by posting. The Park Store is open only on weekends and holidays through the winter. 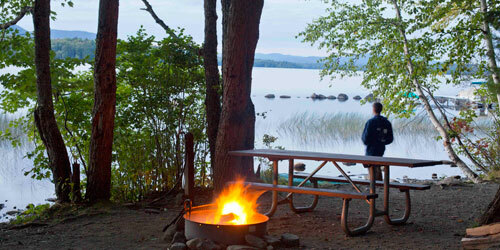 Camping may be done at Gilson Pond Campground and at Monadnock Headquarters Campground. Gibson Pond Campground closes during the winter. The park also has a store. Franconia Notch State Park is in the White Mountain National Forest and is named for a notch, or passage in the mountains. 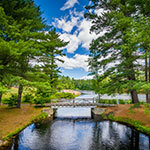 Among the beautiful features of this park are Flume Gorge, Echo Lake, and the Franconia mountain range. Echo Lake offers swimming, fishing, boating and rentals of canoes and paddleboats. Open to the public from mid-June to early September. 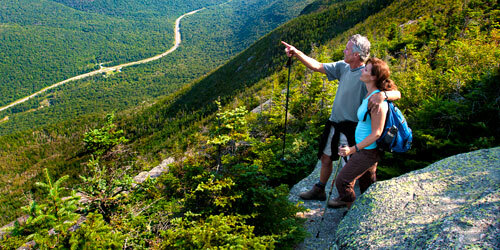 The Farnconia Notch Bike Path travels the entire length of Franconia Notch and provides access to all parts of the park. Cannon Mountain provides bike rentals and shuttle service for bicyclists. Among the attractions of the region are the Cannon Mountain Aerial Tramway. 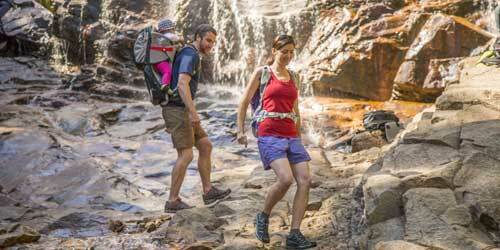 Learn about more Franconia State Park attractions. This is a place of spectacular mountain views, hiking trails, waterfalls, and fishing locations. It encompasses the Flume Cascades, the Silver Cascades, and the Arethusa Falls. Also in the park is the Willey House, an 18th-century way-station for travelers through the mountains. The campground in the park has 36 wooded sites, restrooms, showers, flush toilets, drinking water, fire rings, a laundry, and picnic tables. It is accessible to handicapped people. This park is always open for recreation, but during the off season there might not be any staff available, Visitors should possess the necessary knowledge, skill, and equipment to maintain their own safety. Umbagog Lake State Park offers a beach area for swimming, fishing, and boating. Canoes, kayaks, and rowboats are available for rent. A boat launch and fuel sales are available. The Boston Globe called Lake Umbagog the number five top kayak spot in New England. 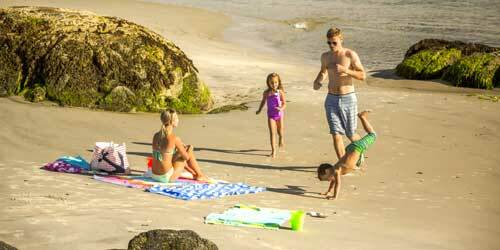 On the shore of giant Lake Winnipesaukee, this park has a 600-foot long sandy beach that is open for swimming, paddling, and fishing. It has a boat ramp. Great park for a day of water sports and picnicking. Park has an RV campground with 37 sites and hookups. Reservations required. Tents camping is not allowed. Camping fee is $47 per rig with water, electric, and sewer hookups). Pets are not allowed in the campground or in other areas of the park. Park is open and staffed late May to mid-October. Season passes are available. are available. White Lake State Park is on glacial White Lake. There is a maintained foot path around the lake, good for watching for wildlife, loons, or beavers. Trout fishing is done here. There are boat rentals of canoes, kayakes, paddleboats, stand-up paddle boards, and rowboats. Additionally, the park has a day-use area and a campground with family campsites and youth group sites. Camping fees are $25 (no hookups); $30 (water view, no hookups); and $50 to $75 for either of two large family sites. Park is open full time from late May to Labor Day, and weekends only from Labor Day to mid-October. Lifeguards are on duty full time from late June through early September. Lifeguard hours are 9 a.m. to 5:30 p.m. daily. Admission is $15 per passenger vehicle for the parking area at South Beach. Season passes are available. This location gives access to the Pemigewassett River for river swimming, paddling, fishing and picnicking. The recreation area is part of the Livermore Falls State Forest. Parking lot is available on Livermore Falls Road off Route 175. There is a canoe and kayak launch site and pit toilets. Pets not allowed in the area. Carry in and carry out all trash. Season: The Pemi River Access site opens for the season on May 25 and closes September 2, daily, 10 a.m.-6 p.m. Dates and times may change without notice. Fees: $5 per car for parking and drop-off fee. Free for NH residents age 65 and over. Located just north of the Presidential Range, the park is ideally located for fishing in the Peabody and Moose rivers. Moose Brook flows through the park, and feeds the swimming area with cool mountain water. Picnicking and swimming against the scenic mountain backdrop. Wentworth State Park spans 50 acres and is located on the shore of Wentworth Lake. Popular activities in the park include swimming, picnicking, hiking, fishing, and boating. 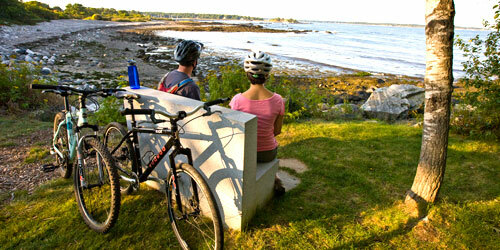 Amenities include picnic tables, a boat launch, flush toilets, and a group use area. The park is open weekends only from Memorial Day weekend to mid-June and daily through late August. Greenfield State Park is a 400-acre park with a lake for swimming and boating; walking paths among ponds and bogs; a small store selling food and souvenirs. Canoes and kayaks for rent. Greenfield State Park Campground has 179 sites, including 134 sites that must be reserved in advance and 45 sites for first-come/first-served campers. RVs are welcome in sites where they fit. Sites are $25 per night, and there are no hookups. Park is open weekends from late May to late June, and daily from late June to mid-October. Campground information. Pawtuckaway State Park offers a pleasant swimming beach on Pawtuckaway Lake; lots of hiking trails, to and elevated point with a fire tower, a marsh that houses beavers, deer, and great blue herons, and a glacial boulder field. Pawtuckaway State Park Campground has wooded 192 sites on Pawtuckaway Lake. Each site has a fireplace, picnic table, tent ground, and parking. Amenities include showers, running water, flush toilets, a camp store, boat launch, and canoe and kayak and paddleboard rentals. Reservations can be made through Reserve America. Mount Sunapee State Park has year-round activities for outdoor recreation. It is Mount Sunapee Resort, with winter downhill skiing. 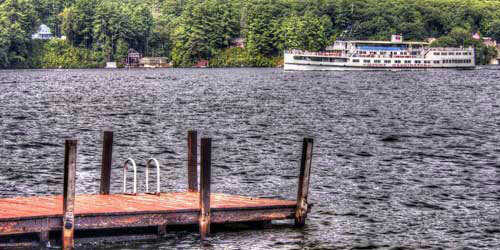 The huge lake at Mount Sunapee State Park Beach offers swimming, boating and other water sports. A boat launch is available with some restrictions. Canoes, kayaks, and paddle boats are available for rent. The campground offers lean-to and platform sites in a natural setting. 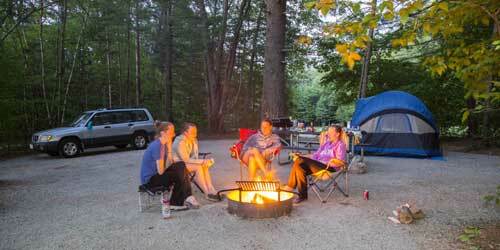 Camping costs $23 to $29 per night and the campground operates from late May to mid-October. Mount Washington State Park is on the summit of the highest peak in the Northeast, with the 750,000-acre White Mountain National Forest spread out below. Views can extend as far as Vermont, New York, Massachusetts, Maine, Quebec, and the Atlantic Ocean. The Mount Washington Observatory is located here. The Sherman Adams Visitor Center has a cafeteria, restrooms, gift shops, and its museum. The park is accessible by the Mount Washington Auto Road (603-466-2222) or the Cog Railway (603-278-5404). Call ahead at 603-466-3347 for the latest summit conditions. The park is unreachable in winter. This small, 7-acre park was founded to honor the memory of President Dwight D. Eisenhower. The park offers picnic area and walking trails and a great view of Mount Washington. Offers a 700-foot beach, fishing areas, and a bathhouse. Lifeguards are on duty. A nice family beach. There is a parking fee. 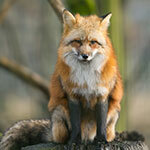 Information: New Hampshire Fish & Game Department at 603-271-3511. Wellington State Park has a large swimming beach on Newfound Lake, one of the clearest and deepest lakes in New Hampshire. Next to the park is a boat launch managed by N.H. Fish & Game. This launch allows year-round access to Newfound Lake and access to the park. The park has beautiful views, a snack concession, volleyball and horseshoe courts. Pets are permitted at the boat access area only. Hiking trails are found inside and outside the park. A peninsula nature trail has picnic grove, designated fishing areas, and plant identifications. One hiking trail from the park leads to Goose Pond, the Sugarloafs, Bear Mountain, Welton Falls, and Mount Cardigan. Park is staffed from late May to mid-October. Admission is adults, $5; children, $2. Rhododendron State Park encompasses a 16-acre grove of Rhododendron Maximum. A 0.6-mile long wheelchair accessible trail travels around the through the grove. The high period of bloom is mid-July. A wildflower trail is located in the forest near the rhododendron grove. Wildflowers bloom from spring to first frost. The grove is home to lots of song birds. The rhododendron grove is a National Natural Landmark in 1982. You may sign up to receive Rhododendron State Park bloom reports by email. Lake Francis State Park lies on the shores of Lake Francis a 2,000 acre lake near the Connecticut Lakes. Popular for fishing and hunting and boating. The lake has a boat launch and canoes are available for rent. Lake Francis campground provides 45 sites, including nine sites with hook-ups and nine sites for ATV camping. Open Memorial Day through Columbus Day. Camping with limited facilities is available starting April 24, and post-season through October. Located on Echo Lake, this is a fine park for swimming and picnicking. Walk the scenic trail around the lake for views of Cathedral Ledge, which looms 700 feet above the lake. Also, an auto road and hiking trails of about one mile in length take visitors to the top of Cathedral Ledge, with views of the Saco River Valley and the White Mountains can be enjoyed. Admission: adults, $4; children, $2. Swimming on beautiful Kezar Lake. Picnic sites near the beach under tall pine trees. Facilities include a bathhouse, picnic tables, and playing fields. 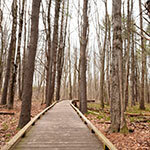 At 10,000 acres, Bear Brook State Park is the largest full-service park in the Granit State. It has 40 miles of trails through forest, hilltops, and marches. Trails are open to hikers, mountain bikers, and horseback riders. Trail map. 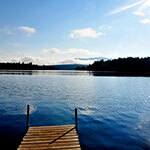 The park allows swimming, fishing and other water sports on Catamount Pond. Visitors can rent canoes, kayaks and paddle boats on weekends. The park has a 100-site campground. See Campground map. The park has two archery ranges; one is operated by the N.H. fish and Game Departments and the other is wheelchair accessible. Users must bring their own archery equipment. A group of museums in the park include the New Hampshire Antique Snowmobile Museum, Old Allenstown Meeting House, and the Civilian Conservation Corps Museum.